Fourth Row Center: Film Writings by Jason Bailey: On DVD: "Cyrus"
Everything you need to know—or remember—about how great John C. Reilly is can be found in the first ten or so minutes of the Duplass Brothers’ Cyrus. As Reilly’s “John” tries to recover from an embarrassing situation with his ex-wife, then attempts to blend in at an upscale party she’s dragged him to, he’s funny, he’s warm, he’s a little bit crazy, he’s a lot awkward. “I am in a tailspin,” he tells a girl that he feels a connection with. “I’m lonely, I’m depressed…” (It’s not exactly party pick-up material.) He’s doing the kind of complex, multi-layered work he was doing for Paul Thomas Anderson in Boogie Nights and Magnolia, about a decade ago when we all started to become aware of this oddly extraordinary actor. His metamorphosis from a respected character actor to a utility player in broad (though enjoyable) Apatow-produced comedies like Taladega Nights, Walk Hard, and Step Brothers was unexpected, but full-throated; there’s never a sense, in any of those roles, of an actor “selling out,” but of a performer having a great time making funny pictures. But one can’t help but wonder if he’s been making full use of his gifts. What’s intriguing about Cyrus is the sly way it combines both of his screen personas—the way it takes what could be a mainstream comic plot (grown, too-attached son tries to break up his mother and her new boyfriend) and grinds it through an indie sensibility to create something altogether more interesting. 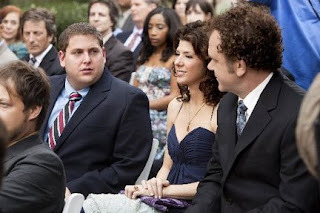 At that party, John meets the beautiful Molly (Marisa Tomei), who is drawn to his honesty and cheerful lack of vanity. Their initial dates go well, very well, but she always mysteriously disappears before it gets too late; one night, he follows her, and in the process of checking out her house, he meets young Cyrus (Jonah Hill), Molly’s son. He still lives at home, a chubby presence in checkered shirts, the kind of guy who has spent his time since school “focusing on my music career.” But the closer John and Molly get, the more he suspects that the kid’s got in for him, and the more we in the audience sense that the film is tiptoeing up to something awful. It wouldn’t be hard to imagine this plot in a bigger-budget studio comedy, something from the Apatow factor or Sandler’s Happy Madison productions—hell, it could be done with the exact same cast, who have all logged their hours in high-concept comedies. But the potentially one-joke premise is given depth, complexity, darkness and pathos by the offbeat execution and the honest performances. Writer/directors Jay and Mark Duplass are among the founders of the “mumblecore” movement, and while Cyrus is more conventionally written and constructed than earlier efforts like Baghead, it keeps some of the aesthetic earmarks—handheld photography, low-key and naturalistic dialogue—and adding some more artistic touches (they try out some new tricks with layering of sound and displacement of dialogue). The technique works in the obvious ways; it seems silly to make such a bland observation as “the doc-style camerawork lends the film a grounding in reality,” but it does, so there you have it. It might be pat, but it plays. And the script has a refreshing distaste for hack situations; after a misunderstanding leads to an awkward public scene, there is (gasp) a scene immediately after in which John and Molly clear the air, just like real people would. The highest compliment to pay the film’s cast is that about a third of the way in, you’ve stop noticing how great Reilly is—he’s not sticking out, because the ensemble is so strong. Hill’s work is, in its own off-key way, something of a revelation. “What is Jonah up to?” I jotted down in my notebook, early in the film; there’s something just a little off about this guy, but he’s putting it across without any of the obvious crutches. It’s an odd, manipulative character who is awful without being “awful”—in fact, while being perfectly pleasant. But it’s a façade that can drop at a moment’s notice, as when he finally comes clean with his would-be stepdad, and icily informs him, “You are out of your league.” But it’s not a dark, villainous turn; he gets (and earns) plenty of big laughs, particularly in the early scene where he plays some of his “music” for John. The joke’s been done before (Ross’s “concerts” on Friends spring immediately to mind), but Hill’s stone-faced intensity is what sells it. Tomei isn’t afraid to play Molly as a little bit of a mess, both physically (her hair sits atop her head in a bit of an unruly mop) and psychologically (she wears her heart on her sleeve, and is too easily handled by her puppeteer of a son). Surrounded by boisterous performers, she wisely plays it right down the middle; watch how delicately she pitches her reactions during their first meal together. Catherine Keener (as John’s ex-wife) doesn’t have the richest role in the film, but she makes the most of what she’s got, finding just the right balance of affection and exasperation with her former husband. By the time the filmmakers work up to the big comic beats—the third act battles between the two angry men—it has been prepared so earnestly and so intelligently, we’re all in. They indulge in the kind of gags and moments that wouldn’t be out of place in a film like Reilly’s Step Brothers, but here, it’s not about situation, but character—how they act and react in the moment. That’s what good comedy is about, and good drama too. Cyrus is both. "Cyrus" debuts on DVD and Blu-ray on Tuesday, December 14th. For bonus feature details, read this review on DVD Talk.